A twist on your classic cheesecake brownie, these five layer peanut butter cheesecake Oreo brownies are the ultimate dessert bars. Hi there! This week, I had the opportunity to do a guest post over on Oh Sweet Basil and I am so excited to share it with you. One of the really fun parts of this blogging journey has been getting to connect with and collaborate with others in the blogging community. It was such an honor when Carrian and Cade reached out to invite me to contribute to Oh Sweet Basil. And they were equally as pumped as I was about the recipe for these peanut butter cheesecake Oreo brownies! Let’s be real though. Who wouldn’t be excited about these brownies?? They are so wonderfully rich and dangerously irresistible, which is exactly how I like my dessert. And apparently I’m not alone because my coworkers absolutely devoured the batch I brought into work for them. Seriously, nothing has ever disappeared so quickly in that office before! 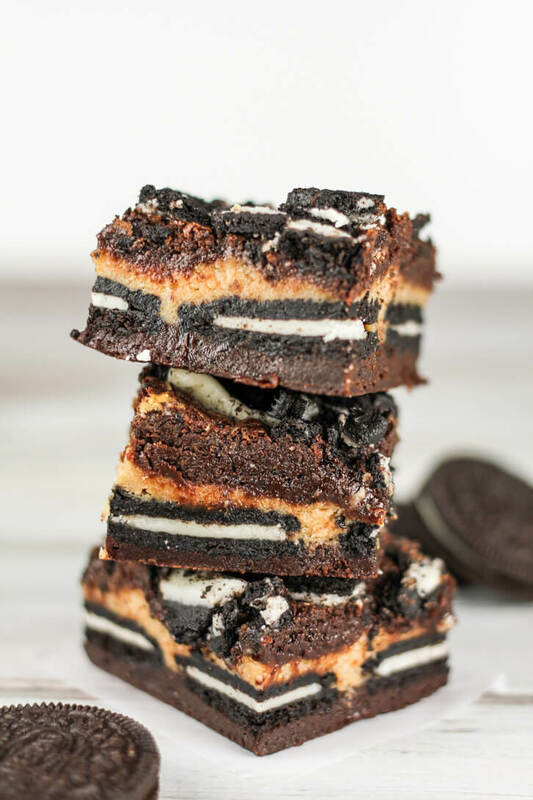 And speaking of irresistible and outrageously good desserts, my peanut butter Oreo layer cake was definitely the inspiration for these peanut butter cheesecake Oreo brownies. The cake was such a winning combo, I knew I had to do a remix on it! And this time, I decided to add cheesecake to the mix as well (you’re welcome!). Obviously, these peanut butter cheesecake Oreo brownies are all about treating yourself, so I went to town and made them five layers high. And the fudgy double chocolate brownies that make up the bottom layer are a treat in and of themselves! On top of that, is a layer of sixteen whole Oreos. Once you slice the bars, I love how you can see the cookies inside each one! Then comes the middle layer, which is a creamy, peanut butter cheesecake filling. It’s the star of the show! Then, more brownie batter and finally, another layer of (crumbled) Oreos to top it all off. The result is one of the most decadent and delicious brownie bars you’ll ever have, promise! Do yourself a favor and head on over to Oh Sweet Basil ASAP for the recipe. Hey Haley! Quick question – do you have the recipe for this?